Birthstones are little encapsulations of our most cherished traits, and these necklaces let them shine. January birthday girls, you're good at this friendship thing. July, your passion is contagious. Birthstones are little encapsulations of our most cherished traits, and these necklaces let them shine. 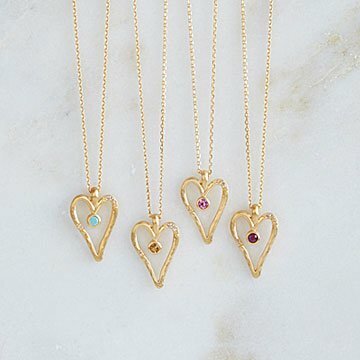 Satya Scainetti places each stone, from garnet (January) to turquoise (December), in the middle of an imperfectly shaped heart. Together, they symbolize all the reasons we love someone—including their impeccable taste in jewelry. Handmade from 18-karat gold plate in Thailand and New York. Satya Scainetti was given her spiritual name 16 years ago at an intensive yoga training in the Bahamas. “I was unsure of the word's meaning at first,” she says, “I soon learned [Satya] meant 'truth' in Sanskrit.” That night, she dreamt she would start crafting beautiful jewelry that was in line with the truths and principles of yoga. Today, that's exactly what she does. Satya runs a small studio in India, creating one-of-a-kind designs centered around mindfulness, the chakras, and ancient Eastern philosophy. She aims to make pieces for the modern, fearless woman, who takes her practice with her everywhere she goes. .55" L x .80" W Chain: 18"